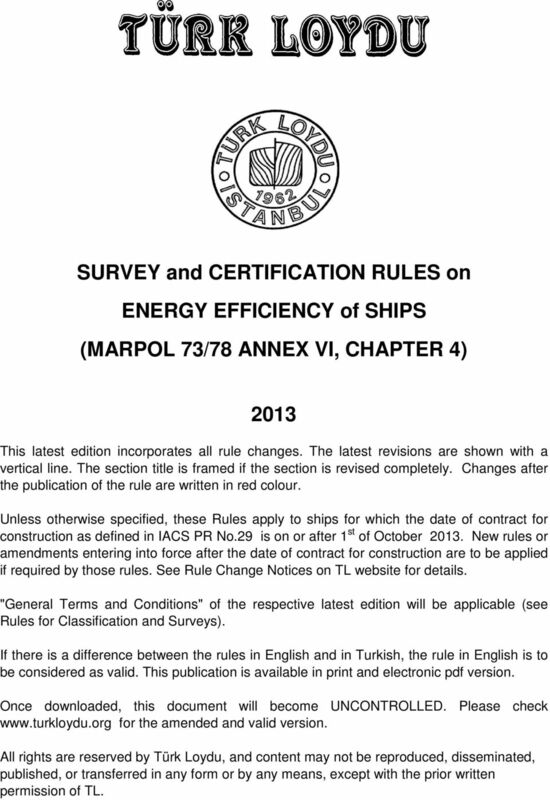 Download "SURVEY and CERTIFICATION RULES on ENERGY EFFICIENCY of SHIPS (MARPOL 73/78 ANNEX VI, CHAPTER 4)"
1 SURVEY and CERTIFICATION RULES on ENERGY EFFICIENCY of SHIPS (MARPOL 73/78 ANNEX VI, CHAPTER 4) 2013 This latest edition incorporates all rule changes. The latest revisions are shown with a vertical line. The section title is framed if the section is revised completely. Changes after the publication of the rule are written in red colour. Unless otherwise specified, these Rules apply to ships for which the date of contract for construction as defined in IACS PR No.29 is on or after 1 st of October New rules or amendments entering into force after the date of contract for construction are to be applied if required by those rules. See Rule Change Notices on TL website for details. "General Terms and Conditions" of the respective latest edition will be applicable (see Rules for Classification and Surveys). If there is a difference between the rules in English and in Turkish, the rule in English is to be considered as valid. This publication is available in print and electronic pdf version. Once downloaded, this document will become UNCONTROLLED. Please check for the amended and valid version. 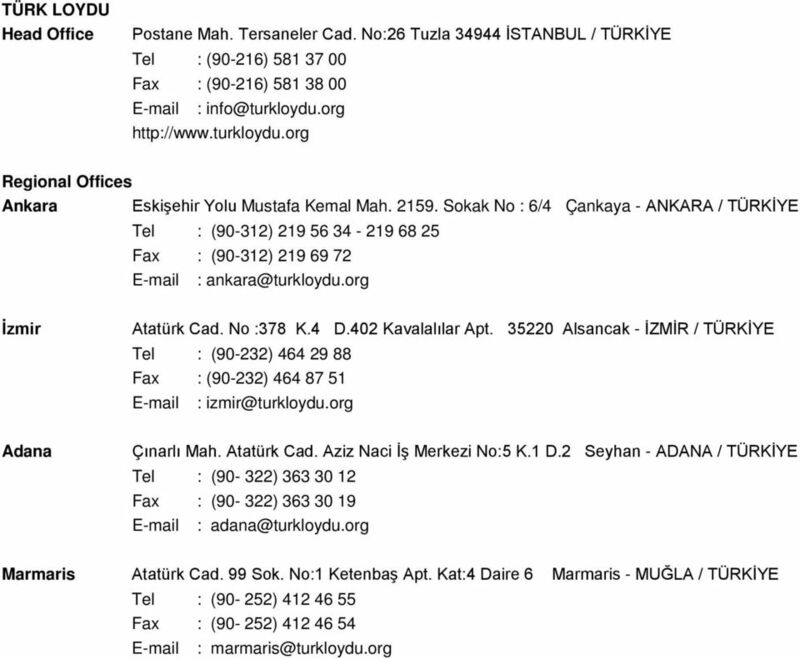 All rights are reserved by Türk Loydu, and content may not be reproduced, disseminated, published, or transferred in any form or by any means, except with the prior written permission of TL. 5 2/24 (MARPOL 73/78 Annex VI, Chapter 4) FOREWORD At the 62nd session of the Marine Environment Protection Committee (MEPC 62) held in July 2011; amendments to MARPOL Annex VI were adopted. 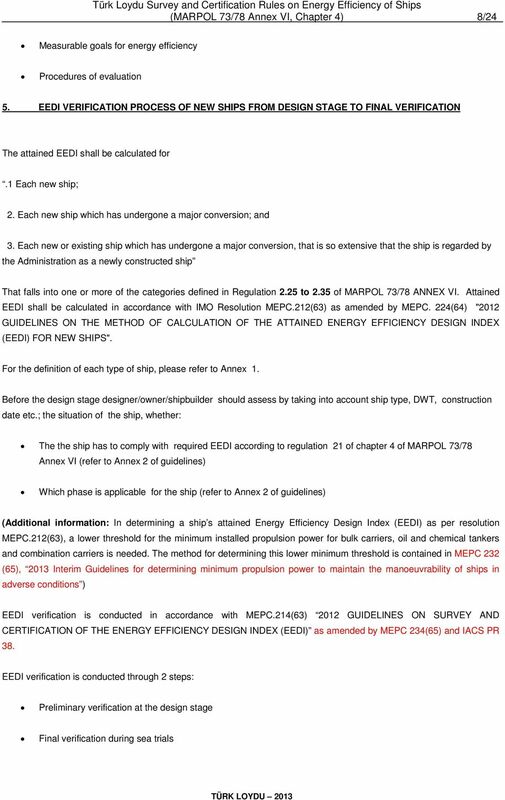 The amendments that make the "Energy Efficiency Design Index (EEDI)" and the "Ship Efficiency Management Plan (SEEMP)" mandatory will come into force from 1 January Türk Loydu Survey and Certification Guidelines on Energy Efficiency of Ships provides detailed information for survey and certification processes related to EEDI and SEEMP. 1. DEFINITIONS OF TERMS USED IN GUIDELINES TL means Türk Loydu "New ship" means a ship: 1. For which the building contract is placed on or after 1 January 2013; or 2. In the absence of a building contract, the keel of which is laid or which is at a similar stage of construction on or after 1 July 2013; or 3. 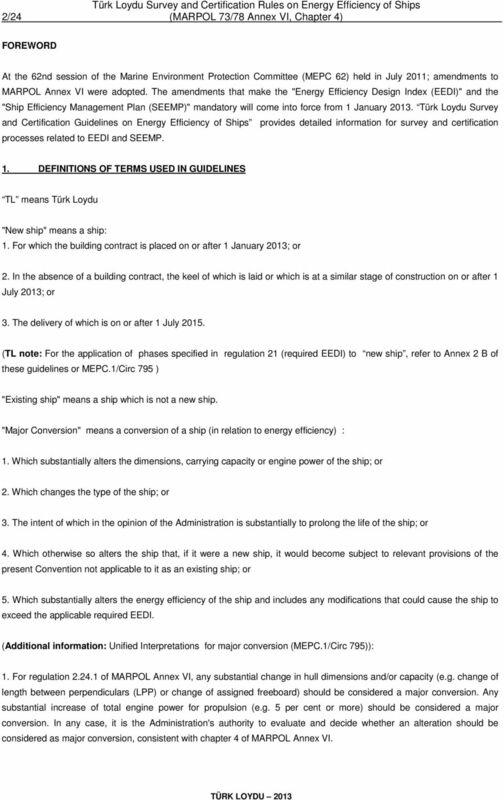 The delivery of which is on or after 1 July (TL note: For the application of phases specified in regulation 21 (required EEDI) to new ship, refer to Annex 2 B of these guidelines or MEPC.1/Circ 795 ) "Existing ship" means a ship which is not a new ship. "Major Conversion" means a conversion of a ship (in relation to energy efficiency) : 1. Which substantially alters the dimensions, carrying capacity or engine power of the ship; or 2. Which changes the type of the ship; or 3. The intent of which in the opinion of the Administration is substantially to prolong the life of the ship; or 4. Which otherwise so alters the ship that, if it were a new ship, it would become subject to relevant provisions of the present Convention not applicable to it as an existing ship; or 5. 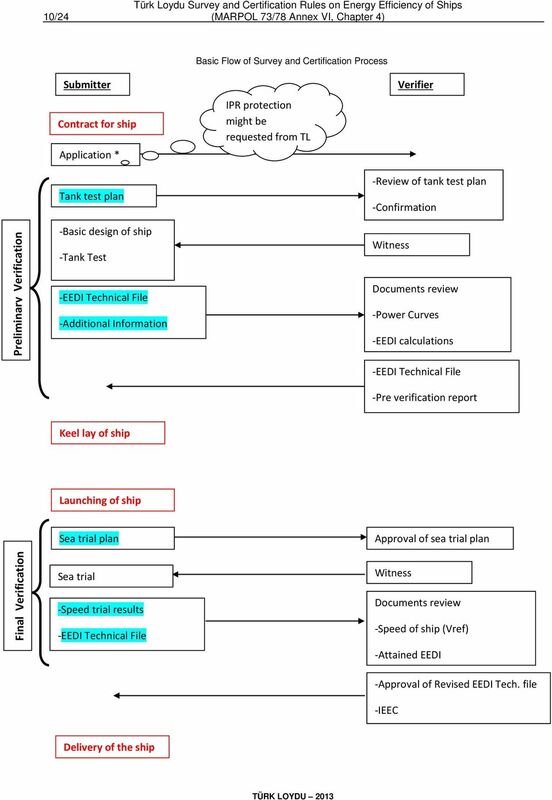 Which substantially alters the energy efficiency of the ship and includes any modifications that could cause the ship to exceed the applicable required EEDI. (Additional information: Unified Interpretations for major conversion (MEPC.1/Circ 795)): 1. For regulation of MARPOL Annex VI, any substantial change in hull dimensions and/or capacity (e.g. change of length between perpendiculars (LPP) or change of assigned freeboard) should be considered a major conversion. Any substantial increase of total engine power for propulsion (e.g. 5 per cent or more) should be considered a major conversion. In any case, it is the Administration's authority to evaluate and decide whether an alteration should be considered as major conversion, consistent with chapter 4 of MARPOL Annex VI. 6 (MARPOL 73/78 Annex VI, Chapter 4) 3/24 2. Notwithstanding paragraph 1, for regulation of MARPOL Annex VI, the effect on attained EEDI as a result of any change of ship's parameters, particularly any increase in total engine power for propulsion, should be investigated. In any case, it is the Administration's authority to evaluate and decide whether an alteration should be considered as major conversion, consistent with chapter 4 of MARPOL Annex VI. 3. 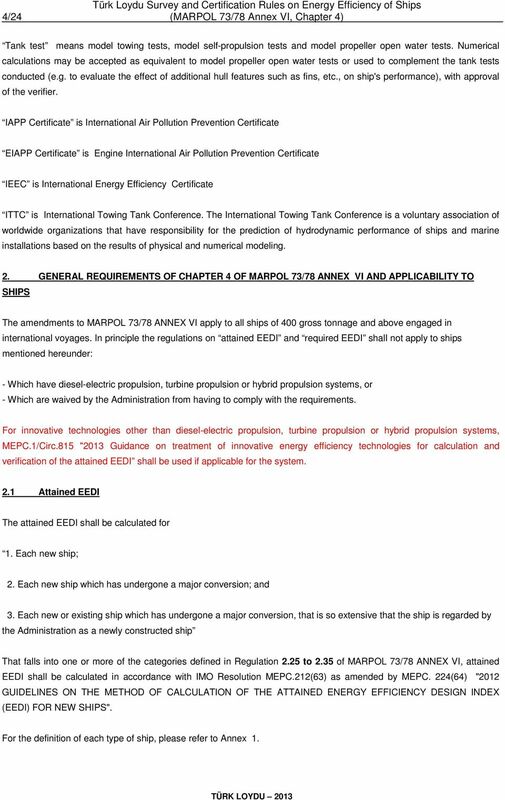 A company may, at any time, voluntarily request re-certification of EEDI with IEEC reissuance on the basis of any new improvements to the ship efficiency that are not considered to be major conversion. 4. 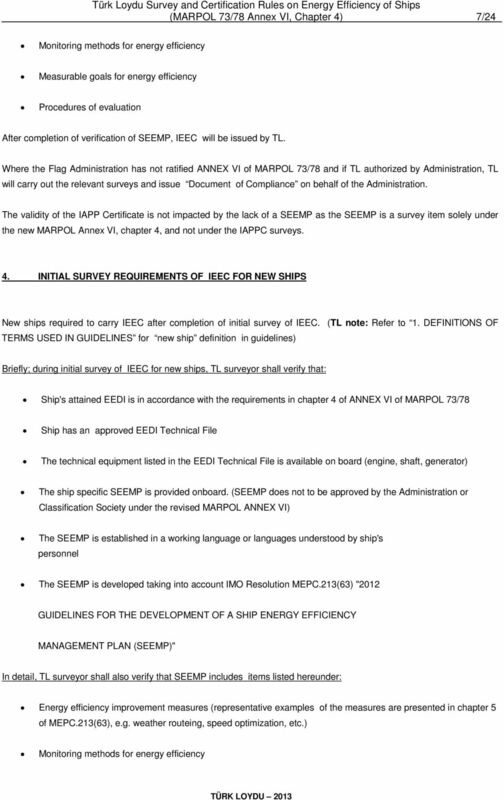 In regulation of MARPOL Annex VI, terms "new ship" and "existing ship" should be understood as they are used in MARPOL Annex I regulation , rather than as the defined terms in regulations 2.22 and The term "a ship" referred to in regulation of MARPOL Annex VI is interpreted as "new ship." (Additional information: For application details of major conversion refer to 6. EEDI VERIFICATION FOR MAJOR CONVERSIONS of these guidelines.) EEDI is Energy Efficiency Design Index "Attained EEDI" is the EEDI value achieved by an individual ship in accordance with regulation 20 of chapter 4 of MARPOL 73/78 Annex VI. 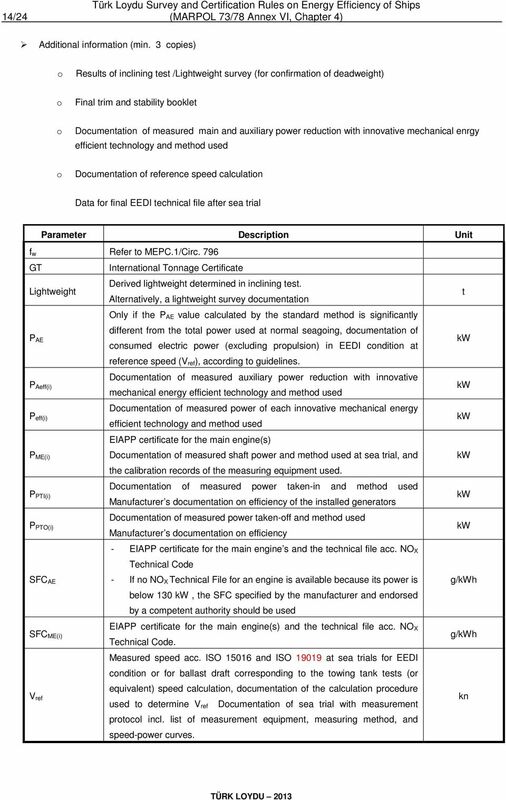 Attained EEDI is specific to each ship and indicates the estimated performance of the ship in terms of energy efficiency. The attained EEDI shall be verified, based on the EEDI technical file, either by the Administration or by any organization duly authorized by it. TL acts as a verifier for the EEDI. "Required EEDI" is the maximum allowable value of attained EEDI that is allowed by regulation 21 of chapter 4 of MARPOL 73/78 Annex VI for the specific ship type and size. "EEDI Technical File" is a documentation package that contains the information necessary for the calculation of the attained EEDI and shows the process of calculation. The EEDI Technical File has to be approved by the recognized organization or a classification society on their behalf. EEDI Technical File should be written at least in English. Reference line is a curve representing an average index value fitted on a set of individual index values for a defined group of ships. The reference lines were established by using existing ships index values for each ship type to which regulation 21 (Required EEDI) of MARPOL Annex VI is applicable. "EEDI Condition" is a ship's loading condition corresponding to the maximum summer load draught in order to determine the capacity under EEDI calculations. For container ships, capacity is to set to 70 % of DWT. For ships other than container ships; capacity is to set to DWT. SEEMP is Ship Energy Efficiency Management Plan. This plan shall be ship specific. The Ship Energy Efficiency Management Plan (SEEMP) is a management plan designed to improve the ship energy efficiency by implementing operational or technical measures such as but not limited to speed optimization, optimum trim, propeller polishing, and energy saving devices. Verifier means an Administration or organization duly authorized by it, which conducts the survey and certification of the EEDI in accordance with regulations 5, 6, 7, 8 and 9 of MARPOL Annex VI. TL acts as a verifier for the EEDI. 7 4/24 (MARPOL 73/78 Annex VI, Chapter 4) Tank test means model towing tests, model self-propulsion tests and model propeller open water tests. Numerical calculations may be accepted as equivalent to model propeller open water tests or used to complement the tank tests conducted (e.g. to evaluate the effect of additional hull features such as fins, etc., on ship's performance), with approval of the verifier. IAPP Certificate is International Air Pollution Prevention Certificate EIAPP Certificate is Engine International Air Pollution Prevention Certificate IEEC is International Energy Efficiency Certificate ITTC is International Towing Tank Conference. The International Towing Tank Conference is a voluntary association of worldwide organizations that have responsibility for the prediction of hydrodynamic performance of ships and marine installations based on the results of physical and numerical modeling. 2. GENERAL REQUIREMENTS OF CHAPTER 4 OF MARPOL 73/78 ANNEX VI AND APPLICABILITY TO SHIPS The amendments to MARPOL 73/78 ANNEX VI apply to all ships of 400 gross tonnage and above engaged in international voyages. 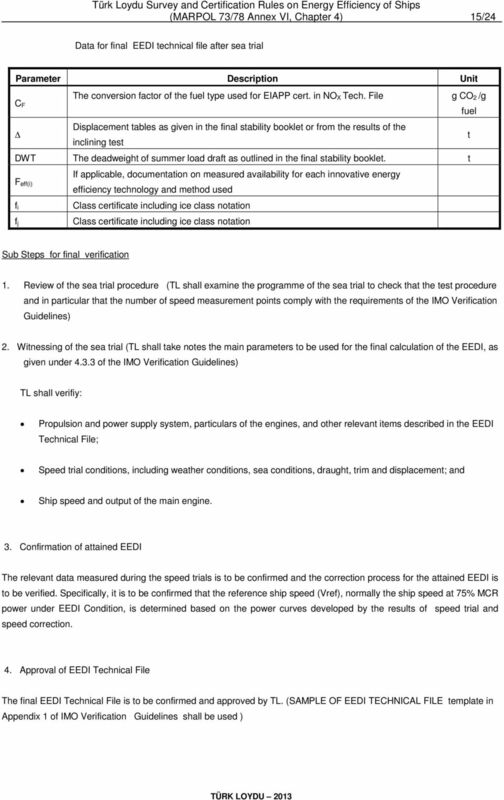 In principle the regulations on attained EEDI and required EEDI shall not apply to ships mentioned hereunder: - Which have diesel-electric propulsion, turbine propulsion or hybrid propulsion systems, or - Which are waived by the Administration from having to comply with the requirements. 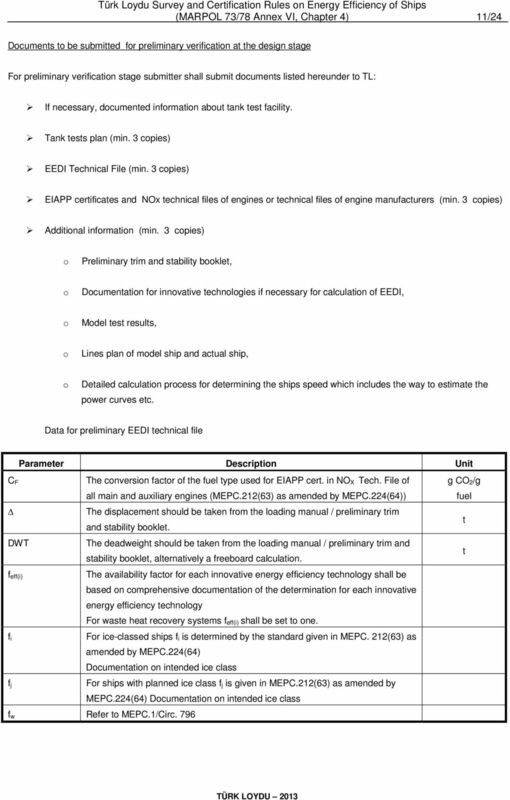 For innovative technologies other than diesel-electric propulsion, turbine propulsion or hybrid propulsion systems, MEPC.1/Circ.815 "2013 Guidance on treatment of innovative energy efficiency technologies for calculation and verification of the attained EEDI shall be used if applicable for the system. 2.1 Attained EEDI The attained EEDI shall be calculated for 1. Each new ship; 2. Each new ship which has undergone a major conversion; and 3. Each new or existing ship which has undergone a major conversion, that is so extensive that the ship is regarded by the Administration as a newly constructed ship That falls into one or more of the categories defined in Regulation 2.25 to 2.35 of MARPOL 73/78 ANNEX VI, attained EEDI shall be calculated in accordance with IMO Resolution MEPC.212(63) as amended by MEPC. 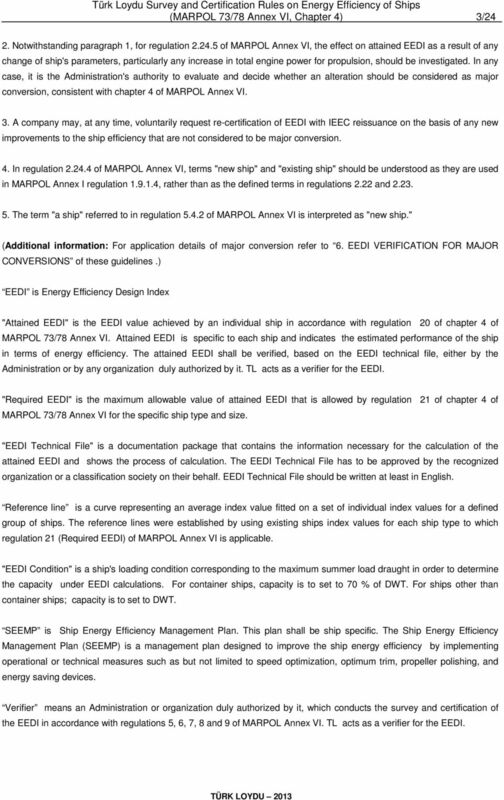 224(64) "2012 GUIDELINES ON THE METHOD OF CALCULATION OF THE ATTAINED ENERGY EFFICIENCY DESIGN INDEX (EEDI) FOR NEW SHIPS". For the definition of each type of ship, please refer to Annex 1. 8 (MARPOL 73/78 Annex VI, Chapter 4) 5/ Required EEDI For each: 1. New ship; 2. New ship which has undergone a major conversion; and 3. New or existing ship which has undergone a major conversion that is so extensive that the ship is regarded by the Administration as a newly constructed ship That falls into one of the categories defined in Regulation 2.25 to 2.31, of MARPOL 73/78 ANNEX VI; a ship's attained EEDI shall be on or below the required EEDI for that ship type and size. Required EEDI is scheduled to become more stringent from Phase 0 to Phase 3 by using a reduction factor from the reference line. 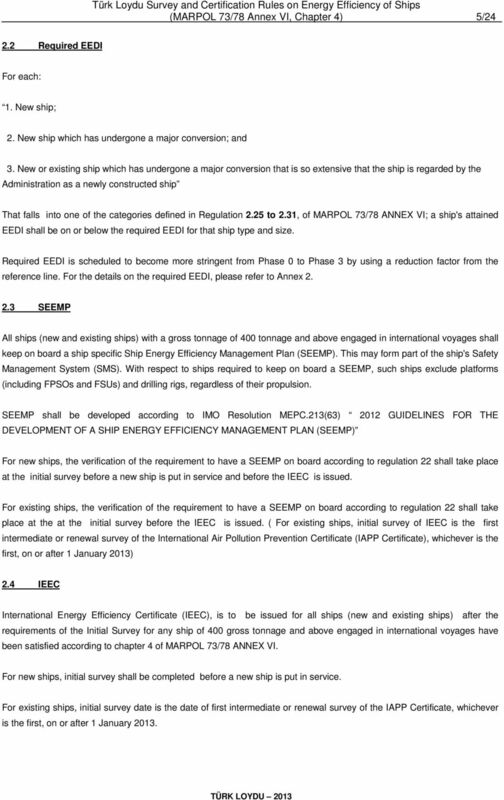 For the details on the required EEDI, please refer to Annex SEEMP All ships (new and existing ships) with a gross tonnage of 400 tonnage and above engaged in international voyages shall keep on board a ship specific Ship Energy Efficiency Management Plan (SEEMP). This may form part of the ship's Safety Management System (SMS). With respect to ships required to keep on board a SEEMP, such ships exclude platforms (including FPSOs and FSUs) and drilling rigs, regardless of their propulsion. SEEMP shall be developed according to IMO Resolution MEPC.213(63) 2012 GUIDELINES FOR THE DEVELOPMENT OF A SHIP ENERGY EFFICIENCY MANAGEMENT PLAN (SEEMP) For new ships, the verification of the requirement to have a SEEMP on board according to regulation 22 shall take place at the initial survey before a new ship is put in service and before the IEEC is issued. 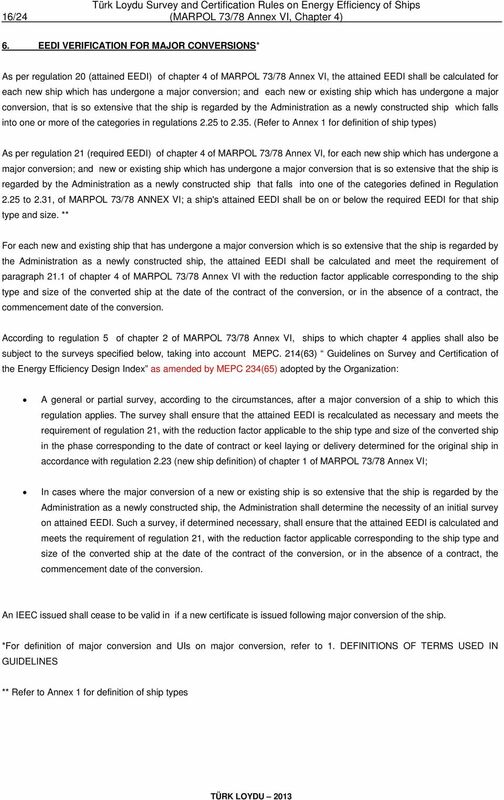 For existing ships, the verification of the requirement to have a SEEMP on board according to regulation 22 shall take place at the at the initial survey before the IEEC is issued. 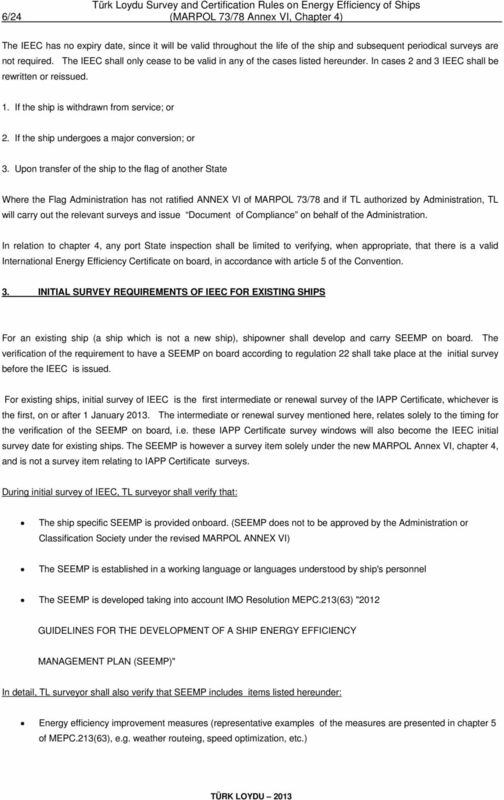 ( For existing ships, initial survey of IEEC is the first intermediate or renewal survey of the International Air Pollution Prevention Certificate (IAPP Certificate), whichever is the first, on or after 1 January 2013) 2.4 IEEC International Energy Efficiency Certificate (IEEC), is to be issued for all ships (new and existing ships) after the requirements of the Initial Survey for any ship of 400 gross tonnage and above engaged in international voyages have been satisfied according to chapter 4 of MARPOL 73/78 ANNEX VI. For new ships, initial survey shall be completed before a new ship is put in service. For existing ships, initial survey date is the date of first intermediate or renewal survey of the IAPP Certificate, whichever is the first, on or after 1 January 2013. 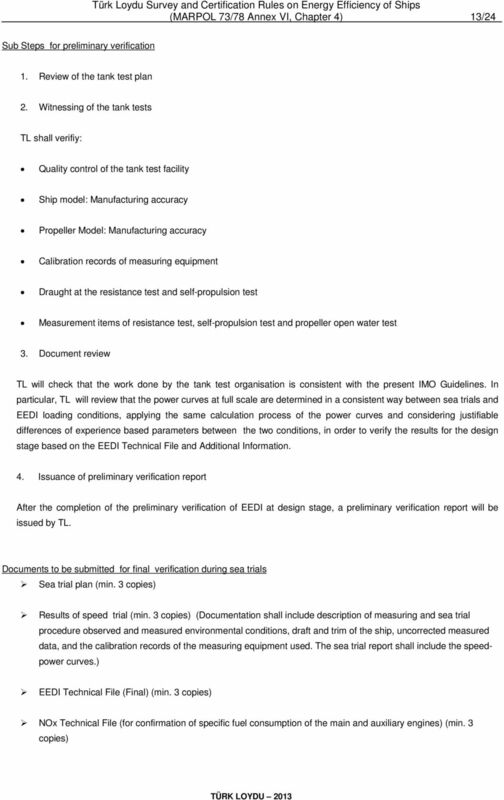 12 (MARPOL 73/78 Annex VI, Chapter 4) 9/24 For ships to which regulation 21 (required EEDI) of MARPOL Annex VI applies, the power curves used for the preliminary verification at the design stage should be based on reliable results of tank test. For ensuring the quality of tank tests, ITTC quality system should be taken into account. If TL has no recent experience with the tank test facility and the tank test organization quality system is not ISO 9001 certified; description of the tank test facility and tank test organisation quality manual shall be submitted as documented information listed hereunder: Descriptions of the tank test facility; this should include the name of the facility, the particulars of tanks and towing equipment, and the records of calibration of each monitoring equipment. Quality manual containing at least the information listed in the ITTC Sample quality manual (2002 issue) Records of measuring equipment calibration. Standard model-ship extrapolation and correlation method (applied method and tests description). TL will audit the quality management system of the towing tank if previous experience is insufficiently demonstrated. Model tank test should be witnessed by the TL. A tank test for an individual ship may be omitted in the following cases: The results of tank tests for ships of the same type are available Speed trials will be carried under the EEDI condition upon agreement of the shipowner and shipbuilder and with approval of the TL. 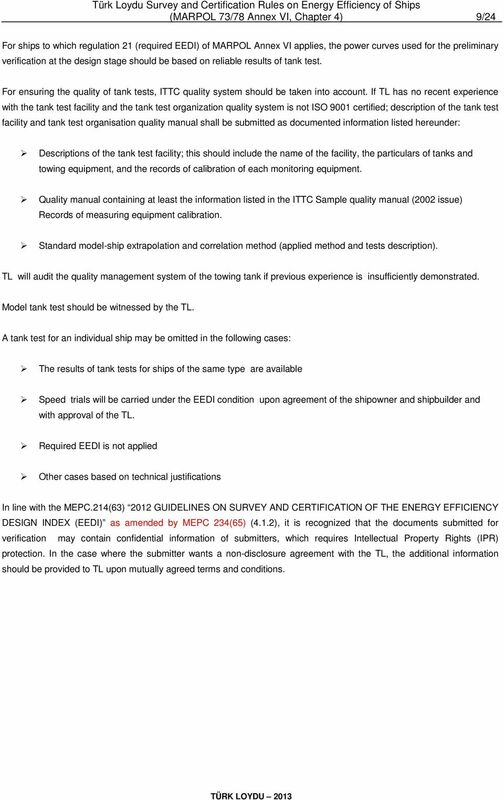 Required EEDI is not applied Other cases based on technical justifications In line with the MEPC.214(63) 2012 GUIDELINES ON SURVEY AND CERTIFICATION OF THE ENERGY EFFICIENCY DESIGN INDEX (EEDI) as amended by MEPC 234(65) (4.1.2), it is recognized that the documents submitted for verification may contain confidential information of submitters, which requires Intellectual Property Rights (IPR) protection. In the case where the submitter wants a non-disclosure agreement with the TL, the additional information should be provided to TL upon mutually agreed terms and conditions. 20 (MARPOL 73/78 Annex VI, Chapter 4) 17/24 Annex 1 Definition of each type of ship according to MARPOL 73/78 Annex VI, Chapter 1, Regulation 2:.25 "Bulk carrier" means a ship which is intended primarily to carry dry cargo in bulk, including such types as ore carriers as defined in SOLAS chapter XII, regulation 1, but excluding combination carriers..26 "Gas carrier" means a cargo ship constructed or adapted and used for the carriage in bulk of any liquefied gas..27 "Tanker" in relation to chapter 4 means an oil tanker as defined in MARPOL Annex I, regulation 1 or a chemical tanker or an NLS tanker as defined in MARPOL Annex II, regulation 1. (Additional information: Fruit Juice carriers shall be categorized as "Refrigerated cargo carriers" as agreed by MEPC 64, refer to MEPC.1/Circ 795).28 "Container ship" means a ship designed exclusively for the carriage of containers in holds and on deck..29 "General cargo ship" means a ship with a multi-deck or single deck hull designed primarily for the carriage of general cargo. 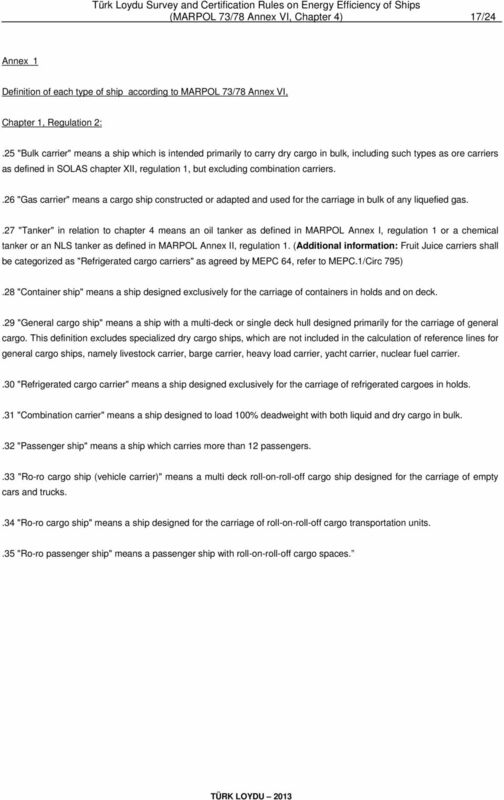 This definition excludes specialized dry cargo ships, which are not included in the calculation of reference lines for general cargo ships, namely livestock carrier, barge carrier, heavy load carrier, yacht carrier, nuclear fuel carrier..30 "Refrigerated cargo carrier" means a ship designed exclusively for the carriage of refrigerated cargoes in holds..31 "Combination carrier" means a ship designed to load 100% deadweight with both liquid and dry cargo in bulk..32 "Passenger ship" means a ship which carries more than 12 passengers..33 "Ro-ro cargo ship (vehicle carrier)" means a multi deck roll-on-roll-off cargo ship designed for the carriage of empty cars and trucks..34 "Ro-ro cargo ship" means a ship designed for the carriage of roll-on-roll-off cargo transportation units..35 "Ro-ro passenger ship" means a passenger ship with roll-on-roll-off cargo spaces. 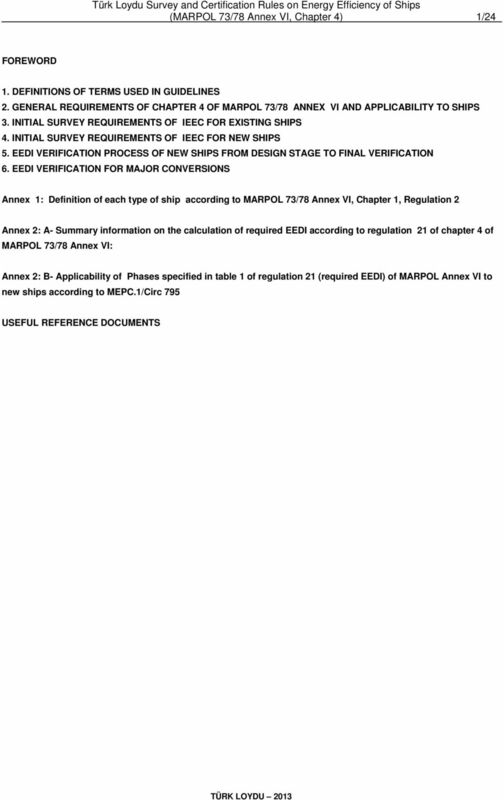 21 18/24 (MARPOL 73/78 Annex VI, Chapter 4) Annex 2 A- Summary information on the calculation of required EEDI according to regulation 21 of chapter 4 of MARPOL 73/78 Annex VI: Attained EEDI Required EEDI = (1-X/100) Reference line value Reference line value = a b c Parameters for Determination of Reference Line Values for the Different Ship Types Ship Type Reference line Bulk carrier xDWT Gas carrier xDWT Tanker xDWT Container ship xDWT General cargo ship xDWT Refrigerated cargo carrier xDWT Combination carrier xDWT Reduction factors (in percentage) for the EEDI relative to the EEDI Reference line Ship Type Bulk carrier Gas carrier Tanker Container ship General cargo ship Refrigerated cargo carrier Combination carrier EEDI Reduction factor (X) Size Phase 0 Phase 1 Phase 2 Phase 3 (DWT) 1 Jan Dec Jan Dec Jan Dec Jan ,000-0 % 10 % 20 % 30 % 10,000 20,000 n/a 0-10 % 0-20 % 0-30 % 10,000-0 % 10 % 20 % 30 % 2,000 10,000 n/a 0-10 % 0-20 % 0-30 % 20,000-0 % 10 % 20 % 30 % 4,000 20,000 n/a 0-10 % 0-20 % 0-30 % 15,000-0 % 10 % 20 % 30 % 10,000 15,000 n/a 0-10 % 0-20 % 0-30 % 15,000-0 % 10 % 15 % 30 % 3,000 15,000 n/a 0-10 % 0-15 % 0-30 % 5,000-0 % 10 % 15 % 30 % 3,000 5,000 n/a 0-10 % 0-15 % 0-30 % 20,000-0 % 10 % 20 % 30 % 4,000 20,000 n/a 0-10 % 0-20 % 0-30 % Reduction factor to be linearly interpolated between the two values dependent upon vessel size. The lower value of the reduction factor is to be applied to the smaller ship size. 24 (MARPOL 73/78 Annex VI, Chapter 4) 21/24 USEFUL REFERENCE DOCUMENTS IMO DOCUMENTS RESOLUTION MEPC.203(62): AMENDMENTS TO THE ANNEX OF THE PROTOCOL OF 1997 TO AMEND THE INTERNATIONAL CONVENTION FOR THE PREVENTION OF POLLUTION FROM SHIPS, 1973, AS MODIFIED BY THE PROTOCOL OF 1978 RELATING THERETO (Inclusion of regulations on energy efficiency for ships in MARPOL Annex VI) RESOLUTION MEPC.212(63) AS AMENDED BY RESOLUTION MEPC.224(64): 2012 GUIDELINES ON THE METHOD OF CALCULATION OF THE ATTAINED ENERGY EFFICIENCY DESIGN INDEX (EEDI) FOR NEW SHIPS RESOLUTION MEPC.213(63): 2012 GUIDELINES FOR THE DEVELOPMENT OF A SHIP ENERGY EFFICIENCY MANAGEMENT PLAN (SEEMP) RESOLUTION MEPC.214(63) AS AMENDED BY MEPC 234(65). : CERTIFICATION OF THE ENERGY EFFICIENCY DESIGN INDEX (EEDI) 2012 GUIDELINES ON SURVEY AND RESOLUTION MEPC.215(63): GUIDELINES FOR CALCULATION OF REFERENCE LINES FOR USE WITH THE ENERGY EFFICIENCY DESIGN INDEX (EEDI) MEPC.1/Circ.684: GUIDELINES FOR VOLUNTARY USE OF THE SHIP ENERGY EFFICIENCY OPERATIONAL INDICATOR (EEOI) MEPC.1/Circ 795: UNIFIED INTERPRETATIONS TO MARPOL ANNEX VI MEPC 64/INF.22: FIRST VERSION OF INDUSTRY GUIDELINES ON CALCULATION AND VERIFICATION OF THE ENERGY EFFICIENCY DESIGN INDEX (EEDI) (Submitted by BIMCO, CESA, IACS, ICS, INTERCARGO, INTERTANKO, ITTC, OCIMF and WSC) MSC-MEPC.2/Circ.11: INTERIM GUIDELINES FOR DETERMINING MINIMUM PROPULSION POWER TO MAINTAIN THE MANOEUVRABILITY OF SHIPS INADVERSE CONDITIONS MEPC.1/Circ.796: INTERIM GUIDELINES FOR THE CALCULATION OF THE COEFFICIENT f w FOR DECREASE IN SHIP SPEED IN A REPRESENTATIVE SEACONDITION FOR TRIAL USE MEPC 64/INF.6: SPEED/POWER TRIALS, PART 2, ANALYSIS OF SPEED/POWER TRIAL DATA MEPC 232(65): 2013 INTERIM GUIDELINES FOR DETERMINING MINIMUM PROPULSION POWER TO MAINTAIN THE MANOEUVRABILITY OF SHIPS IN ADVERSE CONDITIONS. 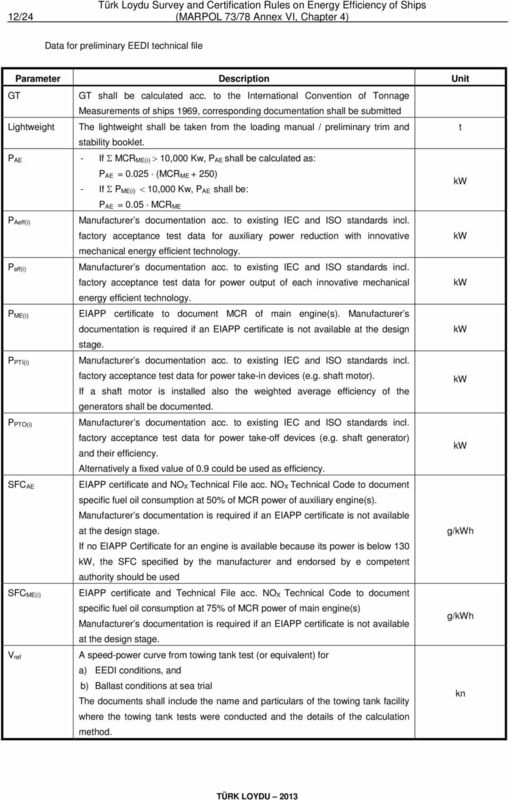 MEPC.1/Circ.815: 2013 GUIDANCE ON TREATMENT OF INNOVATIVE ENERGY EFFICIENCEY TECHNOLOGIES FOR CALCULATION AND VERIFICATION OF THE ATTAINED EEDI IACS PR38: PROCEDURE FOR CALCULATION AND VERIFICATION OF THE ENERGY EFFICIENCY DESIGN INDEX (EEDI). Energy Efficiency of Ships: what are we talking about? 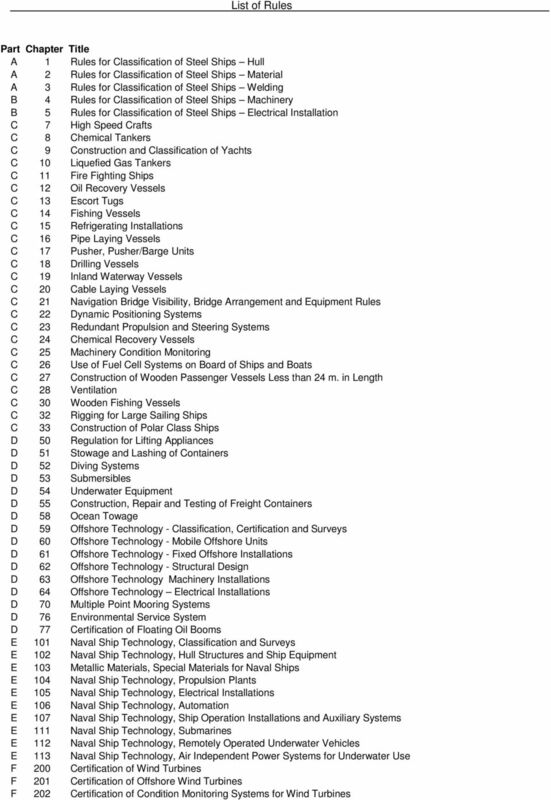 ABS Survey Manager SURVEY STATUS REPORT (FOR OWNER) GYRE REGISTERED OWNER : TDI-BROOKS INTERNATIONAL INC.
Notice to all Ship Owners and Operators; Masters, and Deck Officers of Merchant Ships; Manufacturers, and Suppliers of Voyage Data Recorders. What is on the regulatory agenda?